I’m going to preface this report by saying that I had never been to a comic con before. Needless to say I was extremely excited to go my first one, and the Tri-State Comic Con didn’t disappoint. It was held in Huntington, WV, which luckily for me is only about 40 minutes away from where I live. 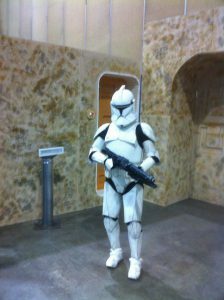 So I headed down Saturday morning, June 9th, not really sure what to expect, but keep reading and I’ll tell you about my experience at Tricon. For starters, I bought the VIP pass for the con. Not only did I get some cool stuff like a VIP exclusive print and a Death Comes to Dillinger trade, but I got into the con an hour early, which is a fantastic deal. Hoping to beat any lines, I went to get the issues I brought with me to get signed. I got the VIP print signed by the artist who drew it, Steve Scott. Steve was also gracious enough sign my copy of JLA #46, something he seemed kind of surprised I brought. He was a cool guy, we talked about how much he was enjoying being there and how it was the kind of place he’d like to move his family to, which was nice to hear. I then made the rounds to get my other stuff signed. Jim Calafiore signed my copy of Secret Six #18 and he told me that he and Gail Simone (who wrote Secret Six) have a Kickstarter coming out soon which I am going to make sure to check out. I also made sure to get Dennis Calero’s autograph on my X-Men Noir #1 comic. Dennis also participated in a panel later in the day, but I’ll talk about that a little further down. 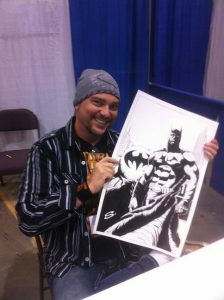 The last thing I made sure to get a John Hancock on was Heroes for Hire #1 which Billy Tucci signed for me. After I got everything I brought with me signed, I had to browse around for some comics to fill out my collection. 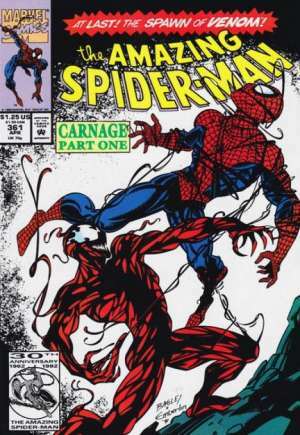 In a dollar bin I managed to find a copy of Amazing Spider-Man #351 so I promptly scooped it up. I also managed to get some issues to fill in some Uncanny X-Men holes, #350 being the biggest (I was beginning to think it didn’t exist). 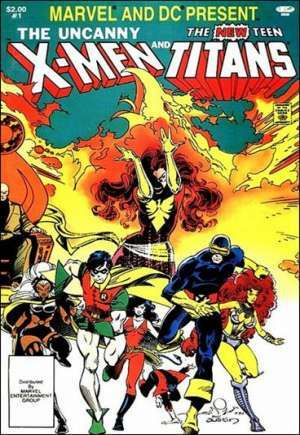 I even managed to find a copy of Uncanny X-Men and the New Teen Titans, one of the early crossovers between the two companies. If you’ve never read it, I highly recommend it. There were a few other books I managed to pick up, but those were the highlights. Once I had rummaged through all the comics (no easy feat mind you) I started walking around to see what I could find. Needless to say, there were tons of artists setup. After browsing through a bunch of portfolios I asked Seth Lyons to cook up a picture of Gambit for me, and boy did it turn out amazing. Michael Mayne also drew Kyle Rayner in his Ion costume for me, and it also, turned out awesome. Lastly, Chris McJunkin, from Junk Drawer Studio, also drew Kyle Rayner, but in a different costume (I’m a Green Lantern fan, can you tell?). As you can see, his piece turned out pretty dang well. Not only were artists available for original art, but they also had tons of prints for sale. I picked up a few prints from Calero, Scott, Lyons, among others (spending waaaay too much money in the process). While there I also sat in on a couple of panels that were scheduled. Two webcomic creators sat down to talk about their comics and advice they had for aspiring webcomic creators. Lora Innes who writes The Dreamer, and Todd Biestel who illustrates Yuri: The Awakening both talked about their experiences creating their comics. One aspect I found very interesting was the vision they had for their webcomic when they started about how it would translate into print. Meaning how they designed the look and feel of the comic to be able to be reprinted in a physical medium without losing any of the flow of the book. Dennis Calero and Tommy Patterson also hosted a Q&A session to talking about their experiences with Cowboys & Aliens and Game of Thrones also being on silver screen. I found it a little surprising that Dynamite told Patterson not to base his character designs on the show, and to do his own thing. Calero also talked about his dealings, including hinting at an upcoming project he wasn’t at liberty to talk about, but he was one person I could listen to for awhile. Tricon also hosted a costume contest which had a pretty good turnout. My favorite group was the X-Men knockoff characters like Gambro, Magnetro, and Strom. But, there was a cool Rorschach cosplay who won the contest, a couple really good Jokers and Harley Quinns, a well done female Eleventh Doctor, and a bunch of others. All in all, the costume contest seemed like a success and I’m sure it’ll be back next year. I think that pretty much wraps up my adventure at Tricon. I had a great time, met some cool people and got a lot of neat stuff. For my first comic con, I have to say I was blown away. I can’t wait to go to the next convention I have on my schedule, which is July 21 in Akron (look for my report after that one too). But, more importantly, I can’t wait for Tricon to come back next year. It was a great inaugural event and is something this area greatly needs. Awesome report! Happy to see these mini-cons getting some face time. I don’t think I’d here of them otherwise! And, totally jealous of your stash! I saw Seth working on your Gambit picture. Do u have a finished image of it? I would like to see the final product. 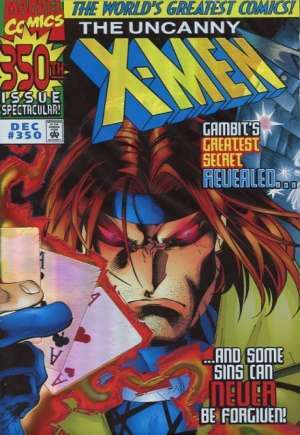 Yea, if you look back in the article where I said I asked Seth for a Gambit drawing, you can click Gambit’s name and a picture will pull up.